Leinster and Ireland legend Brian O'Driscoll has said that if he were in either Ross Byrne or Joey Carbery's position, he wouldn't want to move to Ulster at the moment. Reports yesterday claim that Joe Schmidt and IRFU performance director David Nucifora met with Leo Cullen last week and told him he must choose whether to send Carbery or Byrne to Ulster. After the revocation of Paddy Jackson's contract, Ulster are bereft of option in the pivotal flyhalf position. 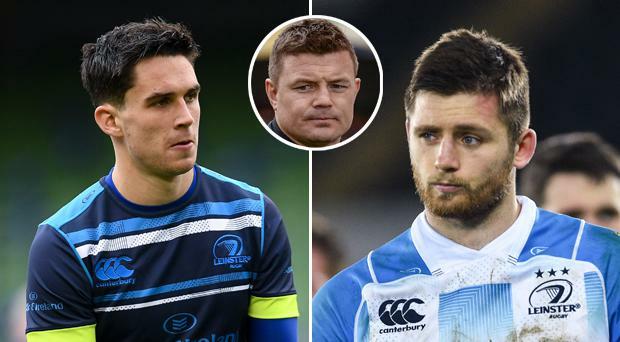 Leinster fans will be loathe to see either of their young stars depart given their level of performance this year and that much of Leinster's success this season has been built on their strength-in-depth. Speaking on Off The Ball AM this morning, O'Driscoll said: "That's the problem with your second and third string players, you don't want them to be THAT good. "You want them to be good but you don't want them to be really impressive because others will come looking for them. "It's tricky for them because they are going to leave, Carbery or Byrne, a winning culture, a winning environment. "Things are clearly not going right at Ulster. They don't have a coach and it's a little bit of a basket case at the moment. "I think it's more likely to be Ross Byrne who will want to go and get more game time that is if Carbery is used a little more often at 10. "Joe Schmidt has been pulling his hair out that Carbery has only had one outing for Leinster starting in the 10 jersey and he's his back-up number 10. That's not ideal. "Someone's going to move and probably very soon just to get game time because you can't have quality three quality operators at 10." When queried about the fact that both players are unwilling to go, he added: "I would too because there is a good chance you're going to be winning medals or in the hunt for winning medals and at the moment, Ulster are a while away from that. "I wouldn't be in a rush at the moment and that wouldn't be my first port of call but maybe they will be encouraged or Joe Schmidt and the IRFU will put an arm around their shoulder and be told that if they have aspirations maybe they need to go and play more regular football. "Ross Byrne has really grown this year and he's got a lot more game time than he would have imagined. "He looked like a nice, solid players and he's really came on. "Joey is a bit looser and he needs to tighten up whereas Ross needs to expand his game a little bit to have more elements to his game." There could be a bit of juggling with the number 10s in the country with Munster also likely to be in the market for a new outhalf. Ian Keatley had an afternoon to forget in Bordeaux yesterday and concern over the long term availability of Tyler Bleyendaal highlight the need for more depth in the position at Thomond Park. "On the basis of yesterday, I don't think Ian Keatley had his greatest game. Tyler Bleyendaal is gone and had another neck surgery as far as I know and two neck surgeries for any professional athlete... I'd be concerned about that as to whether he's going to come back into the game or not. "Keatley has been solid this season, better than other years but is that enough to go and win Europe? I'm not entirely sure. "Whether there is a spot for him to come back into one of the provincial team, I know he's on big money in Bristol and whether the IRFU are willing to pony up remains to be seen. "There are plenty of good outhalves to go around, I just don't know whether we're willing to hand ours over."